Michael Gee is an award winning magician, mind reader and sleight of hand artist. He is a member of The Magic Circle, the most prestigious magical society in the world. Michael is one of the UK’s finest close-up and cabaret magicians with over 15 years of performing experience and numerous TV appearances; you can relax in the knowledge that you are booking one of the very best. Michael is also now established as a creator of his own magical effects. 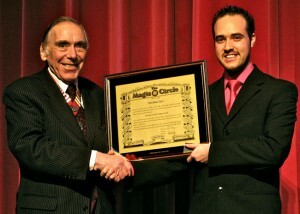 Over time, he has developed his own unique ideas and turned them into a reality, and is now successfully demonstrating this to magicians around the world.